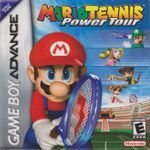 "Mario Tennis: Power Tour (マリオテニスアドバンス, Mario Tenisu Adobansu, Mario Tennis Advance), released in Europe as Mario Power Tennis, is a sports game developed by Camelot Software Planning and published by Nintendo for the Game Boy Advance in 2005. It is the sequel to the Game Boy Color version of Mario Tennis. However, unlike Mario Tennis, players cannot hook their game up with the respective Nintendo GameCube version." Source: Wikipedia, "Mario_Tennis:_Power_Tour," available under the CC-BY-SA License.